In 1859 Florence Nightingale, the founder of modern nursing, wrote that "Beautiful objects and brilliancy of colour are actual means of recovery." Modern practitioners of art therapy agree, and believe that recovery from a huge variety of ills, both physical and mental, can be aided and accelerated using the therapeutic powers of art. The British Association of Art Therapists define it as "a form of psychotherapy that uses art media as its primary mode of communication". The patient or client needs not be at all artistically talented, or even artistically inclined, and the art produced doesn't have to be aesthetically pleasing or accomplished. Instead, the basic premise is that irrespective of an individual's talent or inclinations, the very act of making art involves every human being in a creative process which is, by nature, healing and life enhancing. Unlike in other forms of therapy, the relationship in art therapy is three way; between patient and therapist and image or artefact. In some settings, the therapy involves looking at paintings and art appreciation rather than creation, as the therapeutic tool. When Did it Get Started? The therapeutic value of creativity of all types has probably been recognised for millennia, ever since the eras of cave paintings and hieroglyphics. In the UK, the NHS started employing art therapists in the 1940s, after psychiatrists and psychoanalysts had noticed that drawings and paintings could make a valuable contribution to the therapeutic process. At first, the therapists were simply artists or art teachers with an interest in the subject. Over time, the field has gradually grown and become more widely accepted, and the profession has become formalised. How Are Art Therapists Trained? In Britain, art therapists usually need a first degree in art, then they can start a post graduate diploma which takes two to three years and combines theoretical and practical studies. The studies include psychology and psychotherapeutic theories, as well as obligatory clinical experience. Who do Art Therapists Treat? Quite simply, anyone and everyone. According to its practitioners, art therapy is aimed at children, adolescents and adults; individuals, couples, families, groups and communities. It is used to help those who are under stress in the workplace, or in relationships, as well as abused children, adolescents with eating disorders, patients with bipolar disorder, the bereaved elderly, cancer patients and Alzheimer's sufferers. Does it help? Anecdotal evidence, from satisfied patients as well as art therapists, abounds. In one example, a manic depressive patient attesting to the feelings of release and hard won inner peace gained from art therapy, told of how before she started, she used to regularly cut herself. Having started art therapy, she began slashing at the canvas with blood coloured paint instead, and found that this enabled her to express her rage and anger with all the intensity she needed without harming herself. Abused children who don't respond well to questions may be far more informative and open up more if asked to draw how they're feeling. 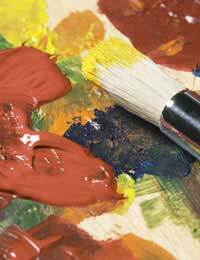 A number of small studies have also shown dramatic benefits from art therapy in a wide variety of settings. For example, it seems that anxiety and depression in cancer patients has been reduced after participation in art therapy and it has been claimed that first time mothers who looked at art and listened to music during labour had shorter labours and requested less pain relief than others in conventional labour environments. The fascinating idea of art as a diagnostic tool has also been raised. American researchers have compared the paintings of temporal lobe epileptics with those of non epileptic seizure patients. They believe that the epileptics have a distinctive style, with a lot of visual scribbling movement and a frame filling motif. So maybe one day art could, as well as helping to heal, also serve as a marker for identification and treatment of epileptics. Alzheimer's disease seems to have a curious relationship with artistic abilities and appreciation. For example, a well known artist, William de Kooning, became frenetically productive during the period in which his Alzheimer's disease developed and worsened. Bizarrely, a rare form of Alzheimer's, known as fronto-temporal dementia, may cause people who were previously not at all artistic to develop aptitude and talent. Art therapy involving either art creation or museum tours for Alzheimer's patients can have dramatic results, with improved mood for hours or even days, and temporarily improved mental functioning, as the patient engages with and discusses the paintings on a level they are no longer capable of bringing to everyday subject matter. The neurologist and author Oliver Sacks has written about this phenomenon, whereby demented patients respond to and delight in paintings at a time when they are disorientated and scarcely respond to words. He speculates that recognition of visual art may engage parts of our brains that remain intact even after dementia has affected many basic abilities. It seems that art therapy is a way of tapping into something very deep, complex and intangible in the human brain that apparently affects our overall wellbeing in ways that we don't understand, but which can be dramatic.